Do you guys remember when the Magic Bullet was all the rave as we ooh’d and aah’d at the infomercials then exclaimed ‘MAN I WANT ONE!’? Then along came the BabyBullet and we wondered ‘WHAT next?!’. Don’t front – you remember. Well – that would be the NutriBullet SuperFood Nutrition Extractor, and TNL’s very own Ash has done fantastic reviews and even made ice cream! Mind equals blown. Ka. Boom. And just like that – the Magic Bullet was left to sit in a corner feeling all sorry for himself and uncool. Well – I’m kicking it old skool. That’s right; I’m going to give the Magic Bullet some love. It is, after all, the OG of Bulletland. … Okay wait…. I haven’t been completely honest with you…. I’m doing this post because I’m not one of the cool kids who owns a NutriBullet (side-eye to Ash), coupled with the fact that a really good friend recently gave me her barely used Magic Bullet for which I am eternally grateful. SO – let’s spread the love. We’re an equal opportunity kind of blog anyway and love sharing our reviews with you! So this is going out to all the Magic-Bullet-will-have-to-do people who have been wondering if and when we’ll do a post about it. Don’t worry – I gotchu. Remember I told you – you’re my peeps. 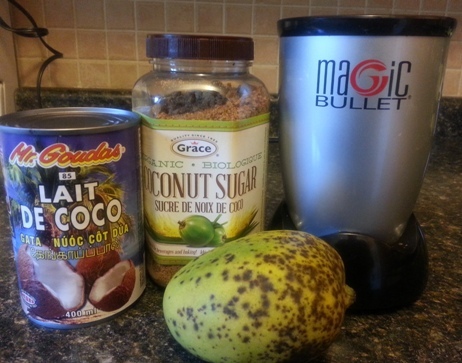 So what’s the difference between the Magic Bullet and the NutriBullet anyway? Well other than the obvious (the latter costs more) it’s all in the motor and size. The NutriBullet has a 600 watt motor and holds 24 ounces while the Magic Bullet has 250 watts and holds 18 ounces.The NutriBullet also has an extractor blade that blends the tougher stuff easier. Yikes. Okay, that’s cool. So what we’re saying is the NutriBullet is the new and improved Magic Bullet. BUT that’s okay because the Magic Bullet is still a handy little gadget all the same. 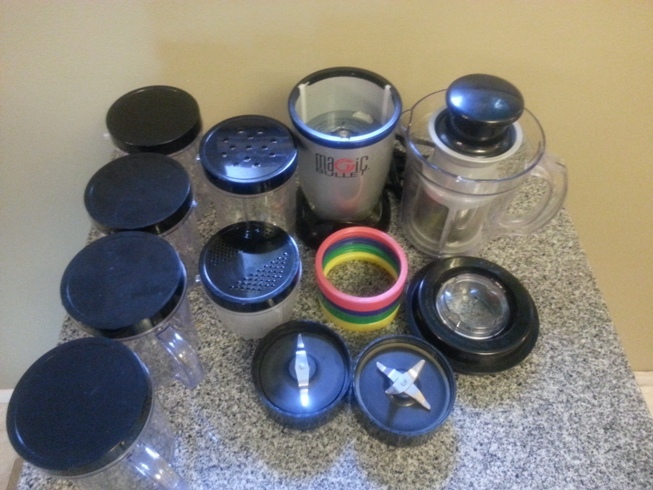 It came with the base, 2 blades (cross and flat), tall and short “bullet” cups, shaker and steamer tops, resealable lids, 4 mugs with coloured lip rings, a blender mug and a juicer. I LOVE smoothies just like everyone else, and I’m quite happy that now I can make one in seconds with minimal mess as compared to a regular blender. And stuff like >>THIS<< no longer happens. PHEW! (But really, let’s take a moment to shake our heads at that blunder). My version of the green smoothie usually includes: almond milk, flax-seed, spinach, celery (sometimes kale), papaya with any variation of 2 or 3 of: apples, mangoes, strawberries, bananas, blueberries or peaches. I told Ash the celery gives a slight HEY GIRL at the end – I love that little kick. There is no end to the ingredients you can use as it comes down to personal preference and what benefits you’re looking for. Some people use carrots, parsley and even avocados to name a few. When I remember to buy some, I also use granola. Because I was warned that it doesn’t get through the frozen fruit very easily, I usually throw all the ingredients in the cup and let them thaw in the almond milk for a few minutes while I continue getting ready for work. Then I rev that little bad boy to prepare my mid-morning deliciousness. Yumnom. Had this been made in a blender it would be all liquidy (and lose all the nutrients) then settle if left for too long. Yay to no more of that! The consistency remains nice and thick and yummy. And because it’s not as powerful as say…. 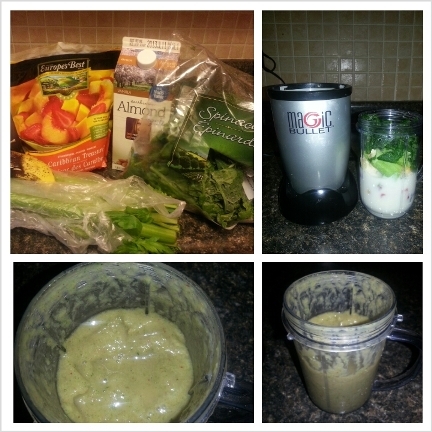 the NutriBullet… there are little surprise clumps of fruit which I actually really enjoy. Not bad, not bad at all. It takes me no time to make one every morning and is definitely less cumbersome than a blender since there’s virtually no assembly. So let’s try the ice cream, shall we? 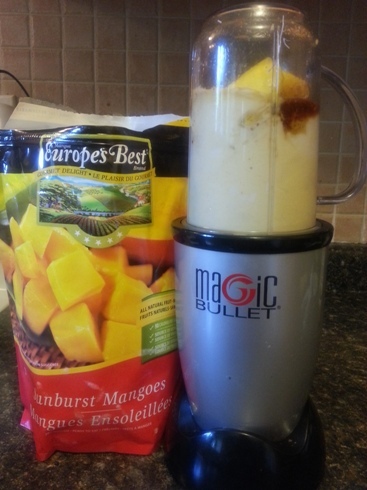 Might I first point out that I had no idea what I was doing, I’m just trying to show that the Magic Bullet can do what the NutriBullet does…. Though it may take a bitttt longer. A fresh mango imported from Tobago, that we no word of a lie call “Ice cream mango” – I’m guessing because of its creamy texture. I don’t know – I just eat ’em. Coconut sugar as the sweetener. Yes, you read right. Coconut. Sugar. Dude. Found at the local grocery store. Because of the less forceful motor, it took a few tries to get through the chunks of frozen mangoes, but it was maybe an extra two or three minutes. But anyway, then it was done! 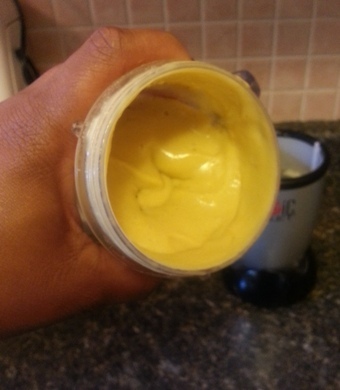 It was a nice smooth and thick consistency then I put it in the freezer until I was ready to enjoy it. 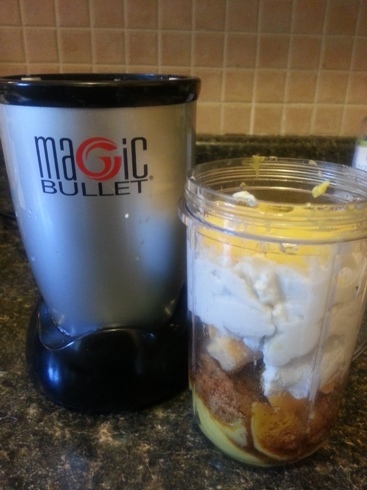 And just like that, the Magic Bullet is cool again (see what I did there?). Well I’m quite content with it and it does the job. Anything to avoid blender blunders. I know that with all the parts you can make many things (dips, soups etc) but I have only really been using it for smoothies. Which do you have, if any? What other things do you make with your Bullet of choice? Share your thoughts, and ingredients if you’d like! I have never heard of coconut sugar. Did you pick this up at a health food store? Nope I got it at the local food basics…. on sale at that! Mmmm smoothies. How does the MB prevent the smoothie from getting liquidy like a blender? Did you find all the different parts a waste? Apparently the baby bullet has like 12,345 parts. I don’t think the parts are a waste, per se. At least this way I can try different recipes and blog about ’em :). With the blender you kind of get the same results (consistency-wise) no matter what you’re making. 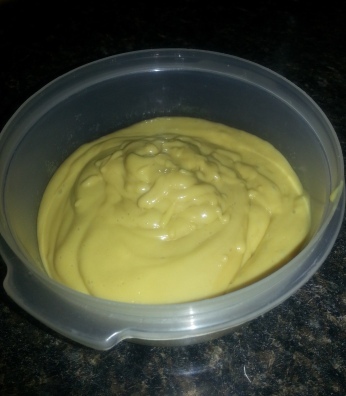 If you put on a bullet for a few seconds,you have a nice thick smoothie where you can taste the ingredients and get benefits, but the blender just…. well blends. Either bullet is definitely a good investment, but as long as you have something that’s the main thing :-). I’ll definitely blog different recipes! 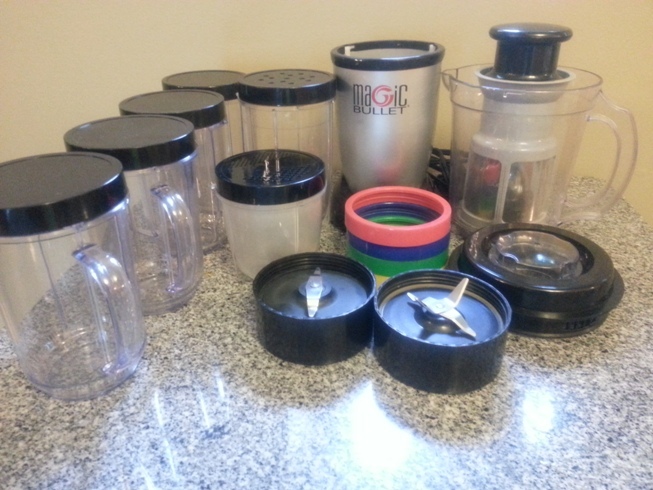 When I read Ash’s post about the Nutri Bullet I was all set to go out and get one – until my BF reminded me that I have a Magic Bullet that was virtually untouched. I sulked, but had to admit he was right – why buy a new gadget when I haven’t given the old one a real try? So far I am happy with the results of the good ol’ Magic Bullet and like you, I enjoy the surprise chunks of fruits that don’t get totally incorporated. I use ginger and ground hemp in most of my concoctions, and whatever fruit I have on hand. The one thing it doesn’t tackle very well is kale – unless you really cut it into tiny pieces first (which I am usually too lazy to do) – but since kale is so darn good for you, I tell myself that I enjoy the big raw kale chunks too. 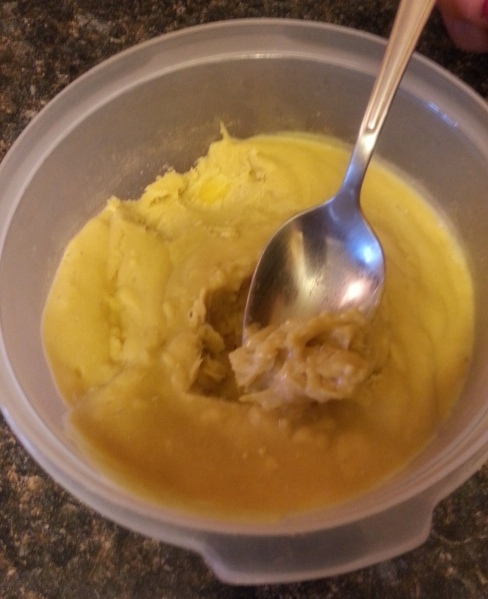 I’ll stay tuned for more recipes, and great post! Thanks Seph! I’ll be trying your ginger and ground hemp suggestion as well 🙂 And I think as long as you have something in which you can make your smoothies etc without the hassle of a blunder…. errrr I mean blEnder… is a bonus! Love my bullet! Got mine from tarjayy (target) and it didnt come with all of these fancy accessories. Womp womp! Post more recipes please. And i love your blog. Keep on blogging “twinsies”. Aww thanks so much – glad you’re enjoying the blog! As I do new things with the bullet, I will definitely share! Thanks for reading, liking and commenting!